Made in the last quarter of the 14th century, Flateyjarbók (Book of Flatey) is probably the finest manuscript that Iceland has ever produced. It originally contained 202 leaves, with 23 more added in the 15th century, all preserved in their entirety. Its importance as Iceland’s national treasure is made clear when Flateyjarbók, along with the Codex Regius (which contains the Poetic Edda), was demanded to be the first manuscript to be returned to Iceland from Denmark in 1971. Bounded in two volumes in the 17th century, this huge manuscript (about A3 sized) contains a series of sagas of Norwegian kings and annals from the creation of the world up to roughly when the book had been finished. Although many of these texts have already been translated and made accessible to English readers, now, for the first time ever, the book is being translated into English in its entirety, following the making of a modern Norwegian translation. This significant and difficult work is undertaken by Professor Alison Finlay, currently professor of Medieval English and Icelandic Literature at Birkbeck, University of London, and Honorary Secretary of the Viking Society of Northern Research. To celebrate this special project and to promote Flateyjarbók to a wider readership, a conference in the form of four seminars was held earlier this month in Den Norske Klub (The Norwegian Club) where the Norwegians in London have been meeting for over 130 years. Together, the four speakers – Haraldur Bernharðsson, Elizabeth Ashman Rowe, Alison Finlay, and Thomas A. DuBois – have covered four different aspects of Flateyjarbók, ranging from the manuscript’s history and provenance to its texts, possible purpose, and illuminations. The conference started with an introduction to Flateyjarbók’s history and its journey between Iceland and Norway. The manuscript was commissioned by Jón Hákonarson, a wealthy farmer in Víðidalstunga in Northwest Iceland who had a great interest in literature. Two priests – Jón Þórðarson and Magnús Þórhallsson – were hired for the job. Jón scribed the sagas of Eirík the Far-traveller, Óláfr Tryggvason, and St. Óláfur; Magnús took over from there, and illustrated the entire work. We get to know this piece information because the manuscript is graced with an introduction, which identifies both the ownership and penmanship, and which makes Flateyjarbók rather unique compared to other medieval Icelandic manuscripts. There are several possible locations where the manuscript may have been made, including the scriptoria at Þingeyrar, Helgafell, and Reynistaðr, though, as Bernharðsson has pointed out during his talk, a church façade depicted in one historiated initial greatly resembles the Þingeyrar seal. Afterwards, Flateyjarbók had been kept within Jón Hákonarson’s family for many generations, until it was gifted to bishop Brynjólfur Sveinsson and taken to Skalhólt in 1647. Around that time, King Frederik III of Norway and Denmark was soliciting books for the Royal Library; he wrote to the bishop to ask for the manuscript. Reluctantly, Brynjólfur sent Flateyjarbók to Denmark, where it remained until 1971. One of the other manuscripts that was sent to Denmark about the same time is Vatnshyrna, also commissioned by Jón Hákonarson and made somewhere between 1391 and 1395. Whereas the focus of Flateyjarbók is the kings’ sagas, Vatnshyrna is a collection of the sagas of the Icelanders. The manuscript was obtained by Peder Hansen Resen in 1686 but was lost in the Great Fire of Copenhagen. Fortunately, Árni Magnússon copied it and retained the orthographic features; it shows a hand that most likely belongs to Magnús Þórhallsson. In addition to its size, introduction, and preservation condition, Flateyjarbók is also unique in the sense that it is beautifully illuminated, which is highly unusual for Icelandic manuscripts. It does not take a manuscript expert to tell that Flateyjarbók has been always intended as ‘a showpiece’ – but for whom? This question was addressed by Dr Rowe, who also discussed the possible purpose for making such a manuscript and who might have been the intended reader. Flateyjarbók may have been intended as a gift to the boy king Olaf IV, who was named after St Olaf and was just 16 years old when Jón Hákonarson began his ambitious project. Jón’s paternal grandfather Gizurr galli used to be a member of the Norwegian royal court, so it would not be surprising that Jón should aspire to achieve the same. If it was indeed the boy king who was the intended recipient, then the kings’ sagas in Flateyjarbók would have been intended as exemplars. The king was supposed to learn from the old stories. Unfortunately, the king died just when Flateyjarbók was barely begun; the news did not reach Iceland until next summer. Whatever high hopes Jón may have had, it was destined to be a lost cause. Prof. Finlay and Prof. DuBois drew our attention to Flateyjarbók’s integrity – both text- and image-wise. Originally, Flateyjarbók may have only been intended to include three sagas: Eiríks saga viðförla, Óláfs saga Tryggvasonar, and Óláfs saga helga. The three protagonists – Eirik the Far-traveller, Olaf Tryggvason, and St. Olaf – are all crucial to bringing Christianity into Norway; in these sagas conversion and intuitive pagans are a recurrent theme. In addition to the thematic integrity, the stories in Flateyjarbók indicate the ambition to cover the entire history of Scandinavia, even though it starts with Eirík. Earlier sagas are mentioned, as if the compilers were conscious of the continuity of the stories – for instance, though the story of Harald Fair-hair, commonly known as the first king who unified Norway, is not told as a separate saga, he is mentioned at the beginning of Óláfs saga Tryggvasonar. That the book is intended as a self-contained whole is also reflected upon the illumination, which was done after all the texts were scribed. The beginning of St Olaf’s saga is coupled with the king’s martyrdom – that is, apparently, what makes him a saint. 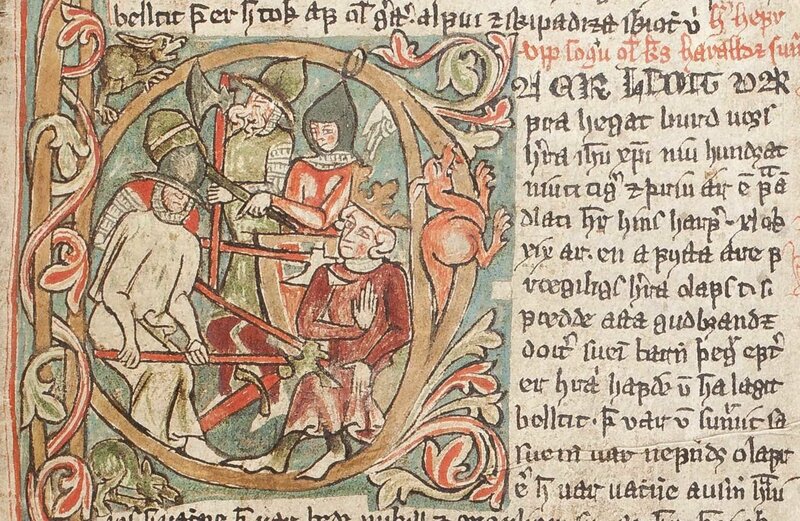 The chapter on Harald Fair-hair begins with a historiated initial depicting Olaf Tryggvason, as if to remind the readers of whose saga this really is. The historiated initial that marks the beginning of the chapter on St Olaf’s birth draws inspiration from images of Jesus’s birth, visually strengthening the link between the two figures. When it comes to Sverris saga, completely different composition is used, as if to make visual difference between the controversial King Sverrir and St Olaf. It will not be unfair to say that, the illuminations in Flateyjarbók function as comments on these kings and their reigns.